After the Rochebonne mark the fleet are hard on the wind on starboard tack in 8-12kts of persistent NE'ly breeze and the long tack is definitely starboard. The breeze was forecast to go left and head them but not much sign of that so far. New leader is Benjamin Dutreux (Team Vendée Formation) who has managed to get slightly to windward of Charlie Dalin (Skipper Macif 2015). At 1100hrs CEST/French time there are 14 nautical miles to make Ile d’Yeu. Sébastien Simon, overall race leader, is still 14th but is just two nautical miles behind the leader, so still well within his 35 minutes leading margin if conditions turn out as forecast. Nick Cherry is 13th, just ahead of Simon. There have just been no options for a comeback for Alan Roberts and Hugh Brayshaw who gybed offshore in line with their weather strategy, expecting the NW’ly to come in stronger from offshore. But in fact the breeze stayed NE all night and they lost too much. Anthony Marchand, (Groupe Royer-Secours Populaire): “Right now I am chasing Dahu (a mythical French-Swiss mountain animal) or Dalin if you prefer. I am just trying to not let him get away too much. He is a bit in front but it is under control. He has been going quick. I got trapped a bit betwen two boats off the line. But it is not over. We will catch a bit. We have been under spinnaker from the start. The wind is more NE’ly and so we will drop the kites and it will be a tight reach. It should be a fairly straight turn up to Ile d’Yeu I don’t know how it is going to go. 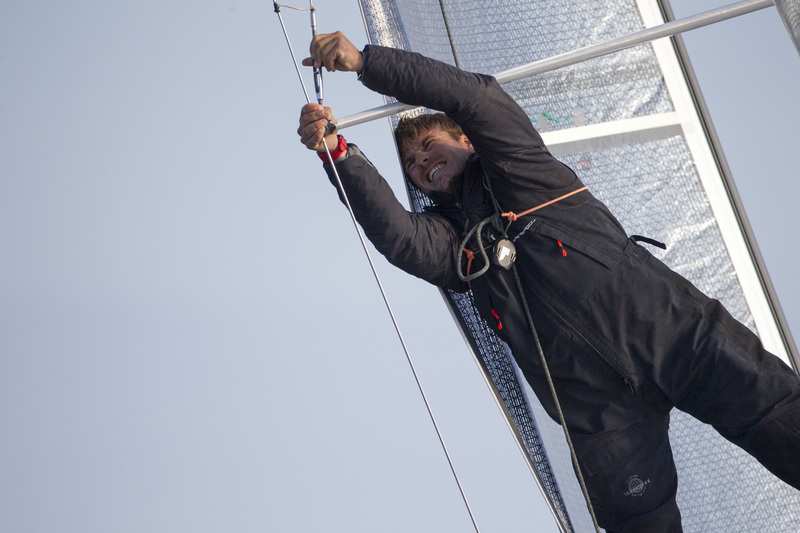 Pierre Quiroga (Skipper Espoir CEM CS) has had to slow and climb his rigging to repair his damaged D2 shroud, not the present he wanted on his birthday.